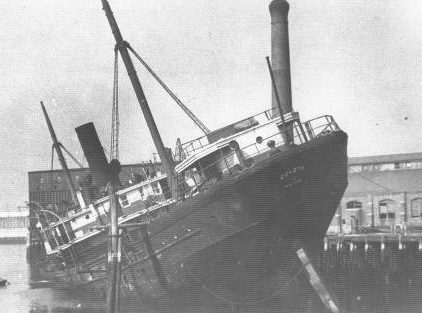 The Coyote’s keel was laid in 1918 and she served as a coal steamer under various ownerships until her demise on October 15, 1923 when she capsized and sank at the dock in Chelsea Creek. In March of 1923 she had struck a rock while en route to to New Bedford harbor. The damaged she sustained was considerable and the cost of the repairs exceeded the value of the vessel. As a result, she was sold for scrap and rotted away at a dock for 8 years until she was towed out and dumped off Boston in January of 1932. She was still carrying some of her cargo of coal when she sank. Today, the Coyote lies in 170 ft of water in the Boston dumping grounds. She sits upright and is largely intact except for the decking, which has collapsed. All that remains of the deck are crossbeams, which are laced with heavy monofilament and netting. The wreck is large and poses considerable entanglement hazards. The minimum depth is 155 ft to the top of the wreck, with washouts of about 170-175′. Like many large semi-intact wrecks, it is possible to get deeper inside the wreck than outside it. Generally, visibility averages 20-25′ of dark water. This wreck is slightly more advanced than some others in the same depth range, primarily because of the risk for entanglement from the spider-web like lines covering it. The wreck was originally located by fishermen in the summer of 1989. It’s identity was subsequently confirmed by a group of divers lead by Capt. Eric Takakjian that same year. The wreck had been forgotten over the years, but was relocated in 2001 by divers from Northern Atlantic Dive Expeditions. While searching for the Coyote, a small dredge barge was located about 1/4 mile from the wreck. The wreck has perhaps 5 feet of relief at the highest point in sits in 165-170 ft of water.